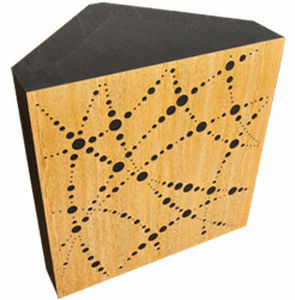 The LF COSMOS® is a low-frequency absorbent panel suitable for applying in the 90º corners of rooms. The absorption peak of this panel is at 100 Hz. 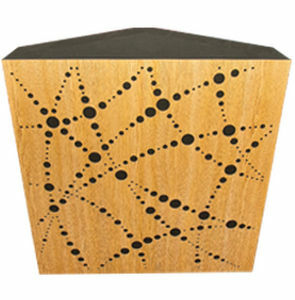 It combines a high-density foam box with JOCAVI®'s melamin faced board finishings. It has exactly the same finishing as the COSMOS® absorbent panel, so we can combine the two models with the same aesthetics. The combined use with COSMOS® will increase the absorption of the nearest harmonic frequencies. The closed resonance chamber has sufficient mass and density to provide a very concentrated and effective absorption coefficient. This panel will become one of the most efficient and inexpensive offers in the market for low-frequency absorbent materials. This panel is mounted by pasting it with our recommended adhesive glue. 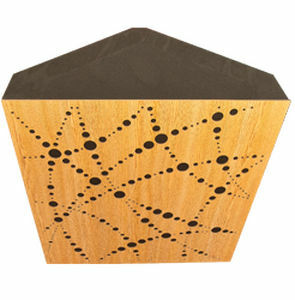 The LF COSMOS® is designed to fit and match the COSMOS® or any other 80mm thickness models. 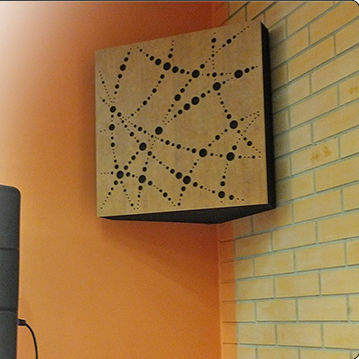 In order to boost bass absorption, we recommend that you use a number of panels enough to fill all the edge corners of the room.